There are many threats to water quality in our region and our water and our river is in peril. Come to Minneapolis to join with other Leagues in meeting the challenge! Date: June 1, 2019 - 10am business meeting; 12:30 educational event. Morning treats and lunch provided. Location: Schaar's Bluff Gathering Space; Spring Lake Park Reserve on the Mississippi near Hastings, Minnesota. Who's Invited: all member League delegates, plus non-delegate League members, family and friends. Our new bring-a-guest option allows you to bring a non-voting guest for lunch and the educational program in the afternoon. Lodging Information: Schaar's Bluff is at the south edge of the Twin Cities metropolitan area. There are literally thousands of hotels in the area waiting for you. One very popular area is Bloomington, MN, home of the Mall of America - and it's just 30 minutes from Schaar's Bluff. Decide on what other activities you will do while you're in the area and then find a convenient hotel. Here are some resources: actually cool things to do in Minneapolis-St. Paul, 150 things to do in Minneapolis, Midwest Living top things to do in Twin Cities. We will be live-streaming this event on Facebook . Watch, like and share! The afternoon part of this event will also be live-streamed on Facebook. Even if you can't make it to the meeting, you can be part of the action! Tune in to our Facebook page Saturday at noon, and share our feed on your page! Click here for a link! 516 Sunrise Avenue, Stevens Point, WI 54481. Prefer to mail in your registration? Print this and fill it in! Choose a Word form or .pdf below. 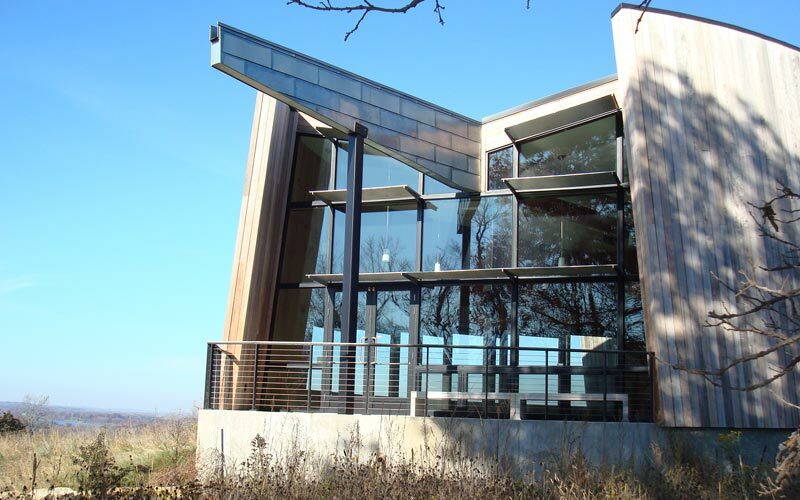 The conference center at Schaar's Bluff offers a commanding view of the Mississippi! Located in Spring Lake Park Reserve, Schaar's Bluff provides a great starting point for hiking and absorbing the beauty of our river!